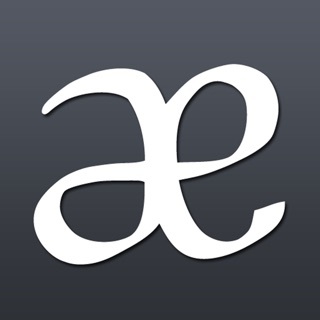 Help perfect your English pronunciation with the best-value, most-comprehensive English phonetics app available. 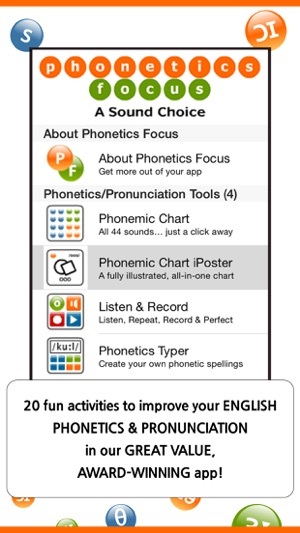 Enjoy 20 fun English phonetics/pronunciation practice activities and resources in one engaging app. Perfect for students and teachers! 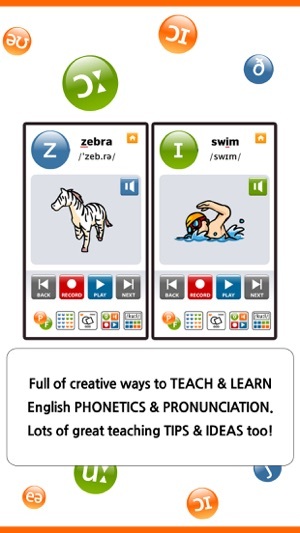 The creators of the highly-popular, British Council ELTon nominated Phonetics Focus, bring you the Phonetics Focus mobile app, helping you to master the sounds of English and perfect your pronunciation wherever you are. 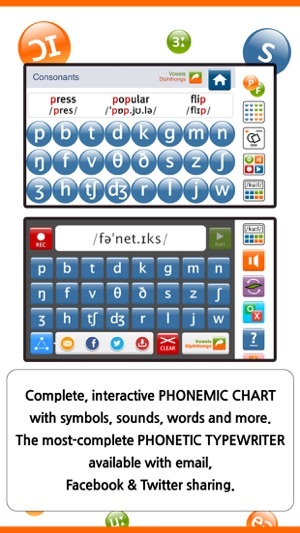 Packed with 20 activities, including interactive Phonemic Charts, Listen & Record, Phonetic Typewriter, scored quizzes, practice tools and printable full-colour flashcard sets (8 sets/350 flashcards), supported with high-quality native-speaker audio, this app could be the only one you'll need to learn, improve and succeed in successfully teaching and learning the sounds of British English. Plus, a chance to win great pronunciation titles from Cambridge University Press, in our free monthly prize draw! 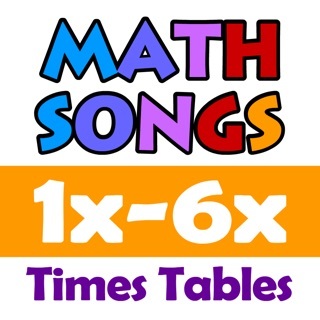 *The perfect partner for our Phonetics Type & Test app! 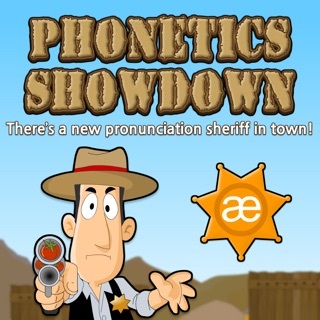 - Phoney Phonemes Quiz: Can you spot the fake phonemes? - Missing Phonemes Quiz: Which phoneme has been removed? 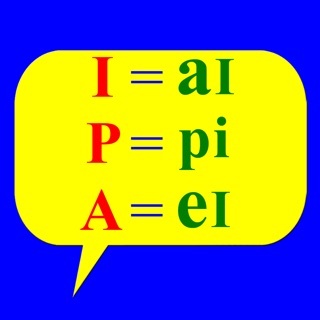 - Minimal Pairs: Which one do you hear? - Phonetic Spelling Test: How's your phonetic spelling? 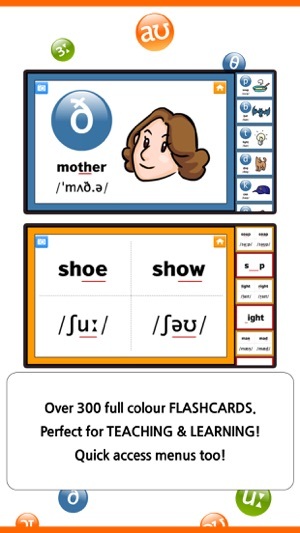 Plus EIGHT sets of full-colour flashcards (350 in total) for you to use on your device, or download, print and use either by yourself, with friends or in your classroom. 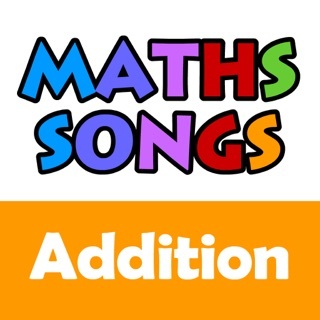 We've also included over 30 TEACHING & LEARNING ideas! * Who is Phonetics Focus for? 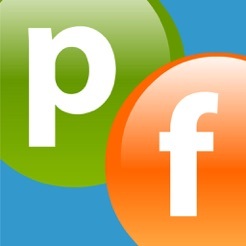 - If you are an English language learner, of any age and from any country, Phonetics Focus provides you with new, exciting ways to learn, practise and improve your pronunciation. 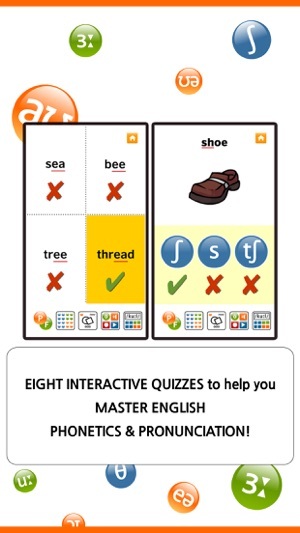 - If you are a language teacher looking for stimulating, high-quality pronunciation/phonetics resources to help your students, Phonetics Focus is for you. 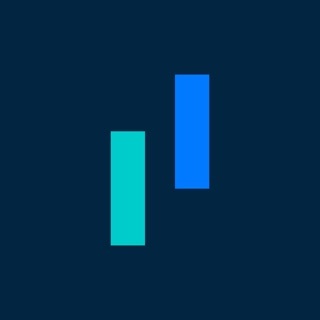 - If you are a non-native English speaking teacher who needs help teaching students the sounds of English correctly, Phonetics Focus is for you. - Linguistics students, at undergraduate or postgraduate level. ***Please email ceoi@cambridgeenglishonline.com with any comments, questions or suggestions. I downloaded this app because it was advertised as helpful for people studying linguistics and for EFL instructors, and I am both. Others have mentioned the positive aspects, but I have to add that there are some things that could be improved. The first really big one is the American English. It would be really helpful to have all the sounds of American English and an option to choose it when the user begins studying. Quite a few of the games and exercises are just pictures with no interactive elements, which I could get for free or even make myself. If these three aspects were improved, I would recommend this to my friends. At the moment, I wouldn't.